The story, according to Snopes, goes like this: an airline offers a promotion that gives the wives of businessmen free tickets. The businessmen choose to take their mistresses instead. The wives find out, the businessmen get divorced, the airline gets embarrassed. The actual story is not quite so tawdry. In 1967, United did run a promotion offering discounted tickets to wives—but only a quarter to a third off, not free tickets. As to the question of whether the women travelling with the businessmen were actually their “wives”… well, surely not all of them were. It is possible United broke up thousands of marriages. But on the other hand, Snopes points out, the story about the disastrous “wives fly free” promotion first appeared a quarter of a century before United’s campaign ever hit the air. In any event, if United found the promotion embarrassing, they found it so embarrassing that they ran it again a year later. In 1967, the first year of the promotion, the airline industry’s revenues rose 20.6 percent. United’s rose 30.6 percent. It’s hard to know how much of that difference can be attributed to any one advertising campaign, but it clearly was a good year for United. A decade later, United still considered “Take Me Along” the campaign to beat when it came to boosting awareness. It was a big bet that paid off. 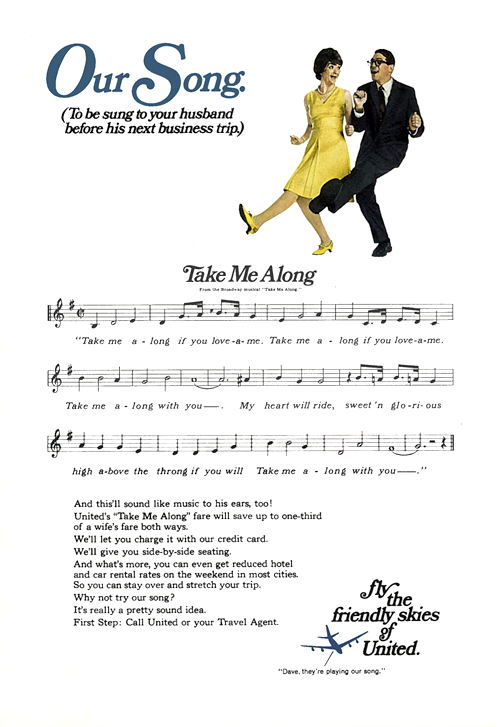 United put quite a lot of weight behind the Take Me Along promotion, launching it with a nine-day, $1.7-million blitz. 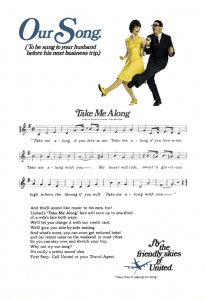 Like many of United’s campaigns from the late 1960s and early 1970s, this one was based around an already-existing song, in this case the title song from a 1959 musical by Bob Merrill. The music and lyrics are unchanged from the musical—the only differences are the spoken bit at the beginning (“I love you little cutie…”) and the tag at the end. The song was the campaign. Even the print was based on the song, to the point of printing the sheet music in magazines. United also distributed 7-inch records, probably to employees, with a six-minute behind-the-scenes look at how the campaign was produced, followed by the audio from the commercial. A storyboard was printed on the back of the cover so people could follow along. It was like the 1960s equivalent of YouTube. Fortunately, we can use the 2010s equivalent of YouTube, YouTube, to see how the spot actually turned out. It had lavish production values, a hefty dose of 1960s sexism, and a famous director. See if you can guess who. Give up? It was Michael Cimino, who would go on to direct The Deer Hunter. Take me along with you! (Spoken) I love you little cutie but the office is my duty! We actually sang this song in the Maywood N.J. Junior High School choir in 1967. Our director, Connie Loiacano, was so much fun and she always chose very contemporary tunes for us to sing. Ahh, but here’s the test: did you sing it because of the musical or because of the commercial? One of the most annoying jingles in the history of television commercials. Made women look like second rate citizens too. Good riddance United.